This list is for the Society's Judges of the future and, as such, have an interest in the Breed and a wish to be included on our Judges Lists. 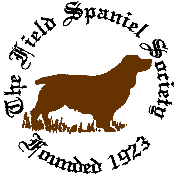 For aspirant judges who have shown an interest in the Breed and have the support of the Field Spaniel Society. To have attended a Breed talk on the Breed standard at a Breed Specific Seminar, since 2005, run by the Field Spaniel Society and to have been given a Certificate of Attendance for the "Presentation of the Breed Standard" element of the Seminar.